At Toh-Atin Gallery, we have a plethora of fine sculptures, paintings, and more that you will enjoy adding to your collection. 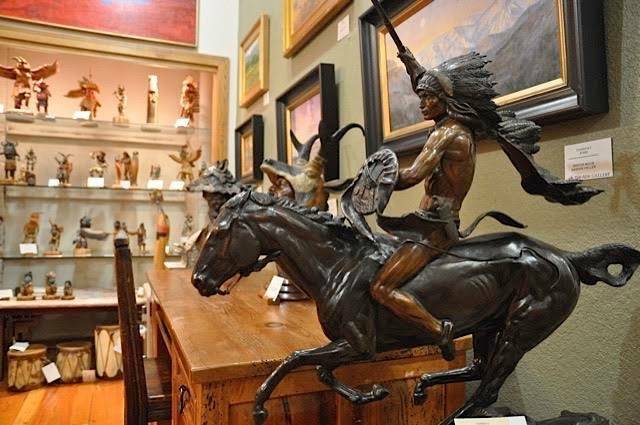 We gather many of our pieces from estates as well as working with the finest living Southwest Indian artists, so we can offer a beautiful selection of fine Native American art Colorado visitors and residents are sure to love. We are always adding new pieces to our stock, and with over 60 years of experience in selling Native American art, we can help you choose the right painting, sculpture, or decorative piece for your home. We have customers from Colorado to Asia, Europe and across the United States who trust in our reputation for authenticity and quality. We take our interest in art seriously and are members of the Indian Arts and Crafts Association and the Antique Tribal Arts Dealers Association. You can trust that when you buy a painting, sculpture, or another piece from our gallery, you aren't just buying a piece or art, but you'll have the opportunity to learn about the artist and his culture. Whether you love to collect Native American art or you just want to add something beautiful and interesting to your home decor, trust us at Toh-Atin Gallery to help you find what you need. You can browse our website for paintings or sculptures in many price ranges. We are sure to have something that suits your budget. Visit our Durango location today, and discover beautiful and authentic Native American art Colorado visitors and residents love. New works are added daily and each time you visit our gallery you'll be certain to find something new to enjoy! "Ceremony" by Arthur Begay, COABKC18-02. "Leaving Sheep Camp Canyon De Chelly" by Hyrum Joe.